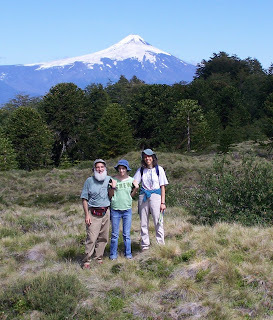 A description of our activities and adventures during our Sabbatical in Chile. 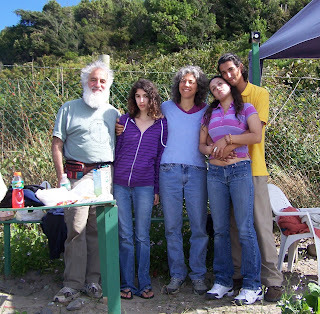 The Torah of "Pan y Toráh"
- - - - - - - - - - - - - - - - - Linda, Jonathan and Shira spent part of a six-month sabbatical in Valparaíso, Chile, from February to June of 2008. 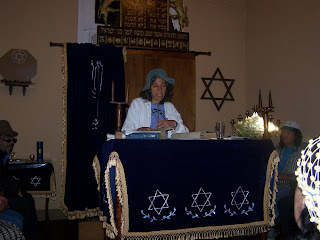 Linda Motzkin and Jonathan Rubenstein are co-rabbis of Temple Sinai, Saratoga Springs, NY. 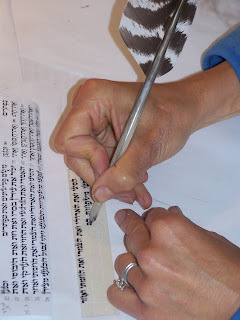 Linda is also a soferet, or Hebrew scribe - one of only a handful of women in the world engaged in this traditional work - and is currently writing a Torah scroll. Jonathan founded and operates Slice of Heaven Breads, a non-profit, volunteer bakery based in the synagogue. For more information, including descriptions of the rabbis' unique "Bread and Torah Project," visit www.templesinai-saratogasprings.org. 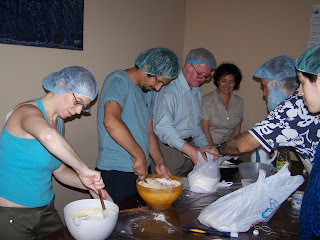 We've had a blog entry already (March 31) about bread baking in Valparaíso, the "pan" part of our "Pan y Toráh" (Bread and Torah) actividades. But what about the Torah part? 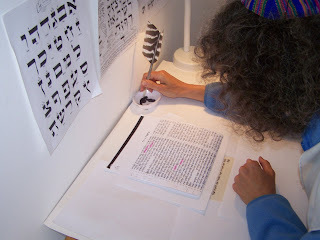 Linda has been working - very slowly but steadily - on writing Torah panels. She gave a powerpoint slide presentation in April to the Max Nordau sinagoga community on "El Mundo de Safrut" (The World of Scribal Arts). She has also given lessons to two aspiring scribes, which in turn has provided her with the opportunity to practice her Spanish in a whole new way. 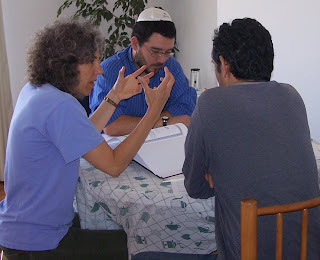 She is currently teaching a weekly course in beginning Hebrew at the sinagoga, using her book Aleph Isn't Tough, which is a bit tougher when it's taught in Spanish. This has provided Linda with an opportunity to learn vocabulary words she might never have otherwise needed, such as: vocales, consonantes, sílabas, prefijos and sufijos. 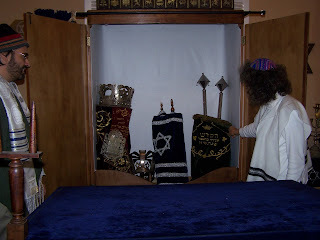 And we just had the opportunity to closely examine with Rabino Roberto Feldmann the three beautiful Torah scrolls in the ark at the Max Nordau synagogue, one of which is the first Torah scroll in Chile and dates back to the founding of the sinagoga. Linda discussed with Rabino Roberto the condition of the scrolls and possible options for some repairs. 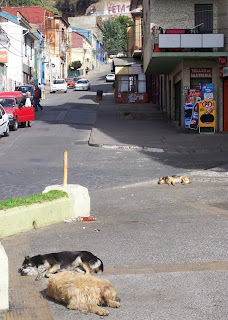 Street animals are one of the inescapable facets of life in Valparaiso. 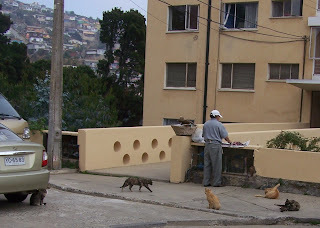 Dogs and cats share the public parks, sidewalks and pasajes (passageways) with pedestrians in a way completely unlike what we are accustomed to in the States. The most noteworthy feature of these street animals is not their number (impressive though this may be) but their mellow demeanor. 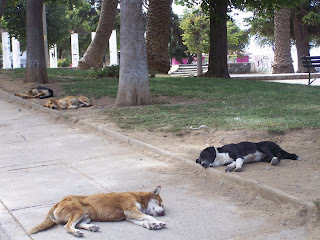 Dogs sprawl across plazas and walkways, ignoring passersby who likewise tend to ignore them. We gringos who expect barking and territorial claims don't quite know what to make of this passivity. On the other hand, dogs behind fences or closed gates on private property seem to understand in such circumstances that they have a job to do, and they can furiously out-bark any gringo guard dog. First, a one-dog shot. 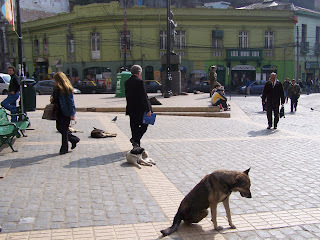 This fellow is sprawled in the middle of a busy pedestrian walkway in Parque Italia (there's Linda in the background). Two dogs. 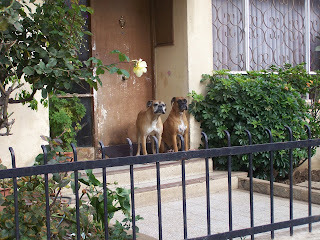 Note that these fellows are behind a fence, and hence are "DOGS on DUTY". They are the only ones you will see who are vigilant and ready for action. The matzah was produced by Yanofsky Hmos. (Hmos. 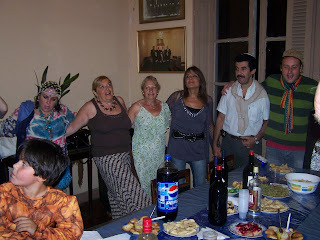 = Bros.) of Buenos Aires. The Haggadah, in Spanish and Hebrew, came from a progressive, egalitarian synagogue, also in Buenos Aires. Figs, raisins, apples, nuts, apricots and pomegranates came from local markets. We made the grape juice from fresh, local grapes we bought at a roadside stand on our way back from a trip to the north – more on that to come. Around our living room for the first night of Passover were 7 Chileno friends (one an 18-month-old), 5 American students or post-grads living in Chile, and the 4 of us (Linda, Jonathan, Shira, with Ruhi in the midst of a 2-week visit). We conducted the Seder in Spanish and we heard new tunes to a lot of the traditional songs. 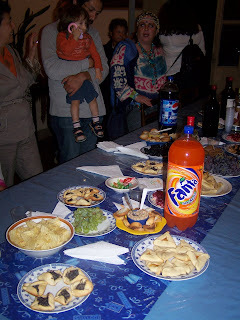 In the South American autumn we were celebrating the coming of spring. During the week before Passover we rented a car for a 4-day trip to the north. 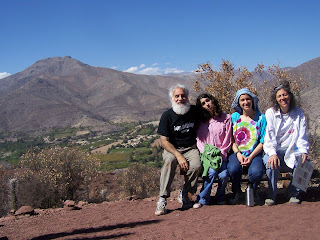 Our destination was el Valle de Elqui, a movingly beautiful area that contrasts fertile, lushly green, narrow valley floors with steep, barren mountains. 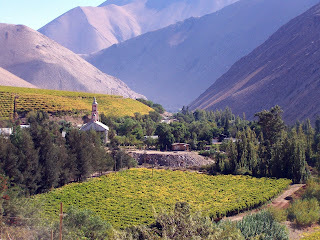 It is known for producing grapes for wine and for Pisco, a grape brandy that is sort of the Chilean national drink and from which a number of popular flavored cocktails are made. We made our way there first heading up the coast, stopping at the picturesque, upscale resort of Zapallar. 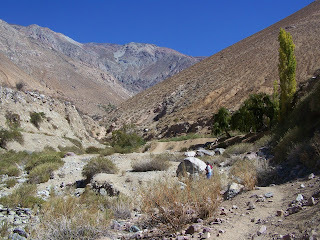 along the Rio Hurtado up to Vicuña in the heart of the Elqui Valley, and then into one of the many valleys that branch off from the Rio Elqui. 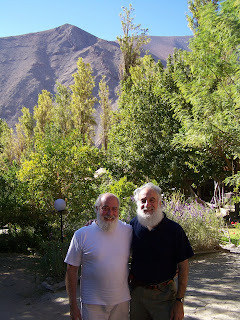 Our initial plan was to spend one night at lodgings that had been recommended to us – Tesoro del Elqui – in Pisco Elqui, but as soon as we arrived at around 6 p.m., with the sun setting behind orange peaks, we decided we would stay for two nights. The lodge and the town were beautiful, romantic and charming. 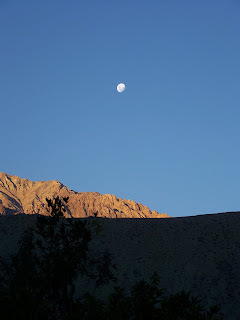 the Andes.We visited a village of artisans (pretty deserted in the off-season) and had a night-time telescope-viewing astronomy lesson – this is touted as one of the clearest places on earth to view the night sky. 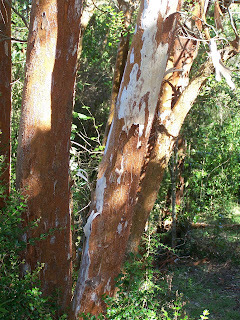 We made a friend – a massage practitioner whose property (where we saw our first ever persimmon tree) is adjacent to the place we were staying, whose name is Anahata (the heart chakra) and whose mother’s family name was Finkelstein. We had a couple of excellent meals and bought some locally produced wine for our Seder. 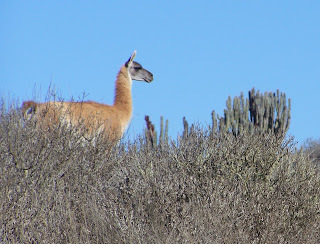 On the way home we took another spectacular unpaved road to Parque Nacional Fray Jorge, an anomalous sliver of temperate rain forest (due to the abundant sea mists) amid the desert hills, where we saw a couple of rare guanacos (related to llamas). 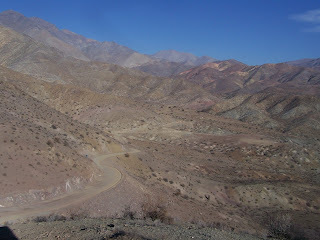 Many of the places we went to on this trip were isolated, remote, and deserted – just the way we like it! 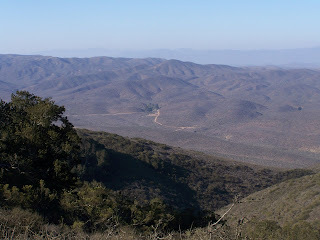 Thus, in the days just before Passover, we had our own journey to the wilderness, with all of the beauty and awe and none of the oppression and hardship. 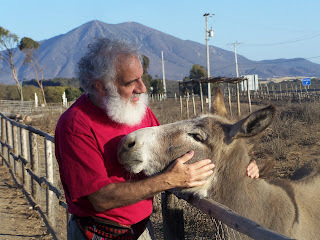 We returned in time to prepare for an unforgettable Chilean Seder with our family (4 out of 5 any way) and good new friends. 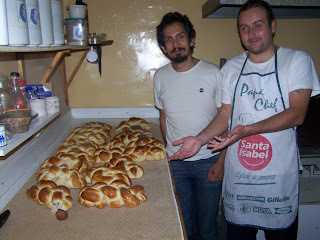 A couple of weeks after we arrived in Chile Jonathan gave a challah baking workshop at the Max Nordau synagogue. It has a very small kitchen and a tiny old oven, so we only baked a few of the loaves there, and the people attending took the rest of the dough home to finish shaping and baking the loaves. 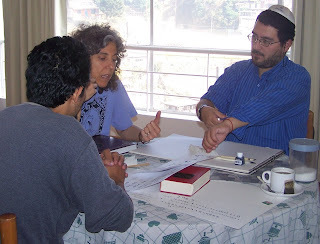 Max Nordau had formed a “Pan y Tora” (Bread and Torah) committee and wanted to continue the project after the initial session, but needed to find a better location. Meanwhile we moved to Valparaíso and Jonathan made the acquaintance of Soledad Lara, who operates a small bakery in our neighborhood called Pan de Magia (Magic Bread - it’s description in Footprint Chile reads “Cakes, cookies, and by far the best wholemeal bread in town.”), and soon started baking there once or twice a week. 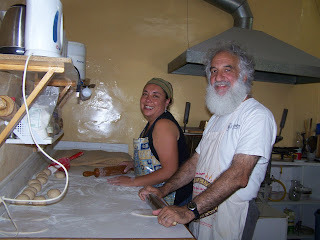 It is a small, homey place, with a good work table and a decent commercial oven; Sole and Jonathan bake together, exchanging recipes and techniques. 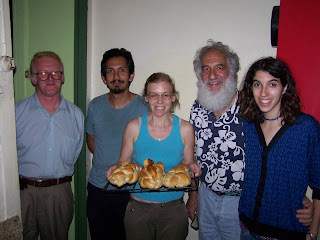 And we soon arranged for the Max Nordau group to hold its challah baking workshops at Pan de Magia. 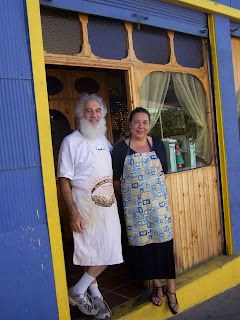 The bakery is in a charming location in Cerro Alegre, near a few other shops and a church where an outdoor fruit and vegetable market operates four days a week (see photo in 3/16 posting, "Beguiled in Valparaíso"). Having the customers come in to meet “the new baker” and sample the wares, standing in the doorway watching the shops open up, chatting with the regulars in Spanish – it’s like living in an exotic foreign country! Being a part of the daily street life of this lovely neighborhood and seeing some “Slice of Heaven” products – like coffee cakes and sticky buns – appearing on the display racks (even when Jonathan isn’t baking), is an unexpectedly delightful aspect of our adventure in Chile. The Sunday before Purim, the vendadores appeared in our plazuela, selling what, at first glance, looked to be bouquets of fresh greens, tied with a string. We wondered if they were some special local produce, freshly come into season, and why they were suddenly being sold in the neighborhood. When we approached one of the sellers to inquire, we realized that they were small branches of palm (and yes, if you can imagine a small, green lulav, that is exactly what it brought to mind). Of course! It was Palm Sunday, and the branches were being sold for la misa (Mass) later that day. So, the next day, it was natural that we thought of Semana Santa (Holy Week) when we saw a group of young men, dressed in torn clothing with dirt and ashes on their faces, begging for spare change on a street corner in El Plan (the downtown trafficky urban center of Valparaíso, which is completely different from the tranquilo hill where we live). These were not your typical beggars; these were young healthy men, the age of college students, who looked like they were engaged in some form of street theater. 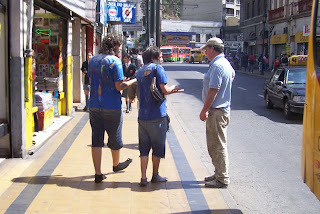 When one of them approached us to ask for spare change, we asked him if what they were doing was something religious, connected to Semana Santa. Oh no, no, this was completely different. These were, as they appeared, college students. (Most of the colleges in the city had begun classes the previous week or two for the fall semester.) The quick explanation that we received was that this begging was something all the incoming freshmen had to do – some sort of initiation rite. Oh, it’s like hazing, we thought. We then started seeing students everywhere, dressed in torn clothing, covered with colorful paint, on their clothes, faces and hair, young men and women, all asking for change. We even encountered on Wednesday a large gathering of students in Parque Italia, in the process of getting smeared with paint and confetti, amidst cheers and laughter. We asked these young women if we could take their picture, telling them we had a son in college back in the states. 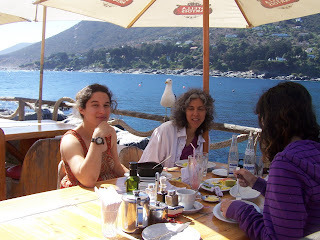 We later got more of an explanation from Paz Schwencke, a new Chilean friend who works at a local hostel, who has been doing a language exchange with us – an hour of Spanish practice for one of us in exchange for an hour of English practice for Paz. Paz explained that this was something all the incoming students did, each day from different facultades (i.e. art students, engineering students, or what have you). The students are sent out to beg money on the streets, which is then used to buy beer for the student parties. Not so very different from freshman hazing. 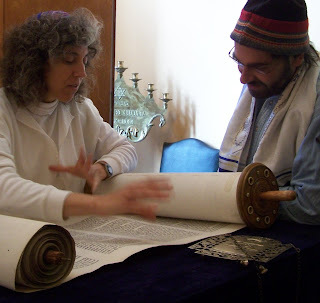 Jonathan was invited to chant some passages from the Megilah and Linda was asked to talk a little about the Megilah she had scribed for Temple Sinai. Following the service, Rabino Roberto Feldmann led everyone in singing and dancing around the refreshments table. Semana Santa concludes, of course, with Easter Sunday. During the week, up in the hills, we had seen children carrying what looked like straw men, which we were told were figures of Judas. 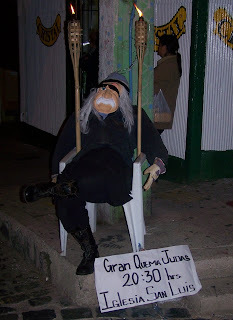 On Easter Sunday, we saw two of these Judases set up in the plazuela near our home and we were asked to donate coins for the burning of Judas. (In fact two groups of eager young boys competed for our coins, each arguing the merits of their particular Judas.) 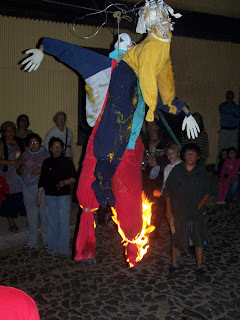 We learned that the burning of Judas would take place that evening at 8:30, not in the plazuela, but in the square in front of the church. By 8:30, a sizeable crowd had gathered. 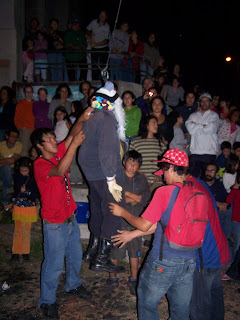 Excited children darted about underfoot, elders shouted “Cuidado!” (Careful!”), as first one, then the next Judas was tied onto a wire strung from one side of the street to the other, doused with lighter fluid, set on fire, and hoisted into the air. We then discovered the purpose of the coins “for the burning of Judas”. 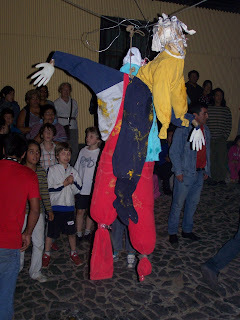 Apparently, they had been put inside the Judases, like candies inside a piñata. As the Judas burned and his limbs disintegrated, the coins inside came tumbling out onto the street and eager children scrambled to retrieve them. “I’ve got enough money for chocolate!” Linda heard one young girl shout to a friend. 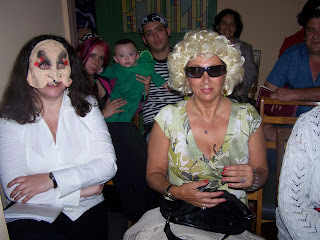 It was a friendly, multi-generational crowd, not so very different from the crowd that might be gathered in a synagogue to boo Haman and celebrate his demise at the end of the book of Esther. There is something universal in this desire to celebrate the triumph of good over evil – and to cheer the downfall of the one identified as wicked. 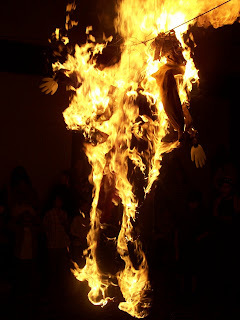 Yet, we felt rather squeamish watching Judas burn. 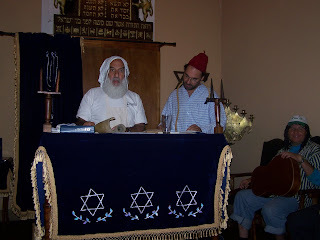 Perhaps it was our awareness that in other places, at other times, not so very long ago, the burning Judases would not have been cloth or paper figures, but real Jews. Or perhaps it was because, in general, burning human figures is something we associate with political or religious extremism, whether it is in the Middle East, Nazi Germany or the Ku Klux Klan in our own country. 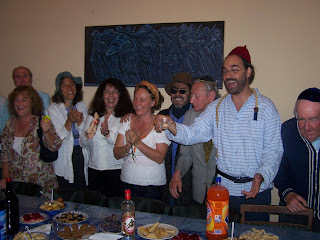 We concluded that we prefer the Jewish High Holy Day rituals of taking responsibility for our own sins and failings over those rituals (including Jewish ones) that identify some other as the source of evil. 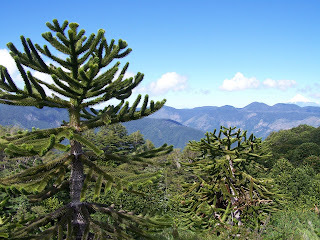 Our trip began with a nine hour drive in a rental car down Ruta 5, the Panamerican Highway - the same road that we have driven in Costa Rica and California, which stretches from Alaska to the Chilean island of Chiloé, one of our destinations on this particular journey. 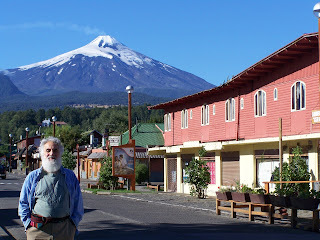 Our first night was spent in Pucón, a picturesque town located on the shores on Lake Villarrica, beneath Volcán (volcano) Villarrica. It has the feel of a western town, like Jackson, WY or Telluride, CO.
One of the guide books says “Pucón boasts the best small-town tourism infrastructure south of Costa Rica.” From here there is access to hiking, kayaking, whitewater rafting, horseback riding, mountain climbing, fly-fishing, skiing – you name it. 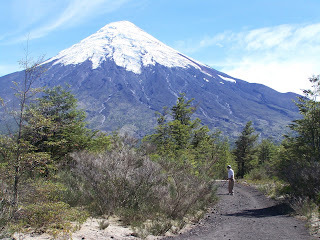 In the morning we drove to a remote park – Parque Nacional Huerquehue (pronounced where-KAY-way) – and went on a four-hour climb to a spectacular overlook with a view of volcanoes, lakes, and Andes peaks. 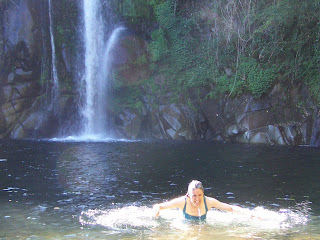 After our hike, we stopped for a quick dip at Los Tres Saltos (the three waterfalls). 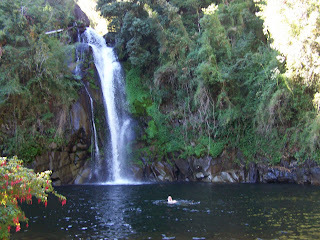 Located on the property of an elderly German-Chilean woman, there was a nominal entrance fee to enjoy her beautiful natural pool - and she also sold fresh baked kuchen. This, surprisingly enough, is a common Chilean pastry in the heavily German-influenced Lakes Region - one sees "kuchen" signs frequently along the road. 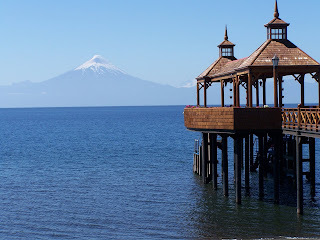 We made our way the next day through this region, driving down the western side of Lake Llanquihue (yan-KEY-way) from Puerto Octay to Frutillar, where there is a spectacular view of Volcán Osorno across the lake. From Lago Llanquihue we returned to the Panamericano and headed to the Island of Chiloé, described variously as “a haven of rural tranquility” and a “misty, verdant archipelago,” where “its rolling hills, covered in patchwork fields and thick forests, provide a lasting sense of rural calm.” It reminded us a little of the remote part of the Maine coast – around Machias and Lubec – where we like to vacation. 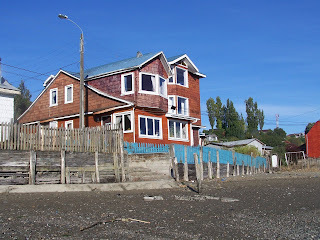 We stayed at Esmeralda-by-the-Sea, a charming and somewhat rumpled hostal right on the beach in the unprettified but picturesque fishing village of Chonchi. On a tip from the owner, Carlos the Canadian, we went for a hike the next day on Isla Lemuy, a short ferry ride from Chonchi. 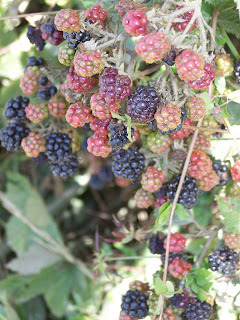 Our destination was a remote beach, where we were told we might find black swans, and be able to pick wild blackberries. 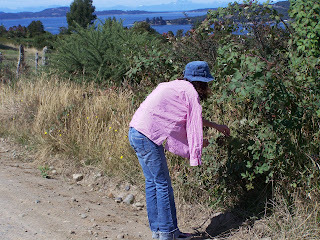 After a 2 hour walk to the beach, during which we gorged ourselves on the heavy bunches of blackberries that grew along the road, we encountered no black swans, but an Aussie couple we had met at the hostel, Mick and Bronwyn. Together we stopped for a cup of coffee at the home of Pedro Andrade, the owner of a campsite on the beach and a small farm where he raises organic vegetables, fruit trees, animals. He offered us a tour of his farm, and spent the entire afternoon escorting us on trails through fields and native woods back to the road that led to the ferry. The weather was beautiful, the landscape dramatic. 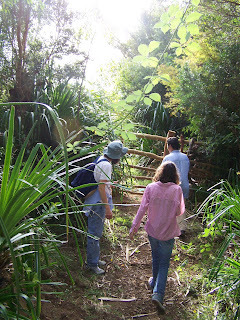 We sampled Pedro’s apples and tomatoes as well as native fruits he showed us along the way. 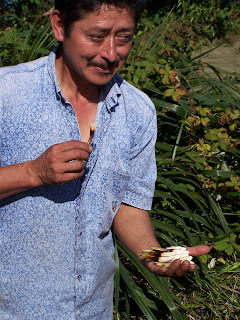 Here's a picture of Pedro offering us chupón – the sweet fruit of the palm/cactus-like quiscal plant. 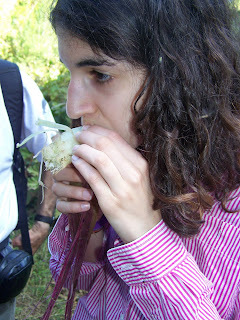 And Shira sampling nalca – the celery-like edible stalk of a native plant with huge leaves called pangue. 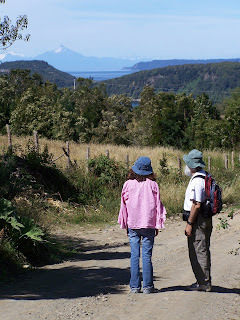 We hiked through forests of arayan trees native to the island (very little of these forests remains today), and walked along 300 year old senderos (footpaths) that were used by Pedro’s Mapuche ancestors. 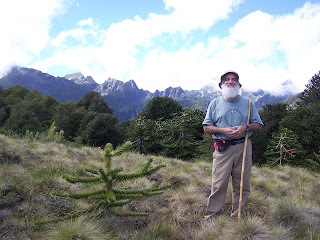 Pedro shared his knowledge of Chilote traditions and customs, of the names and properties of native trees and plants; we felt like we had been blessed with particularly good "traveler's karma" to have run across him. 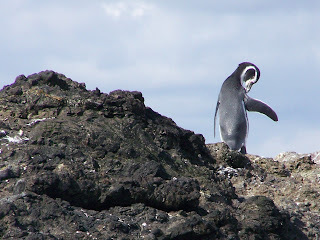 Our "traveler's karma" held up the next day when we journeyed to the northwest (Pacific) side of the island, to see the pingüino colony near Pumillahue. 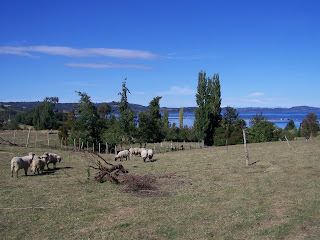 Getting there is not easy; it is 21 kilometers from Ancud, the nearest town, and the last 11 of those kilometers are on an unpaved very rocky road. We picked up a young Chilean couple, Simon and Loreta, who had been able to get a taxi ride only to where the pavement ended. They crowded into our small rental car for the last 12 km, and we wound up sharing a picnic on the beach with them. 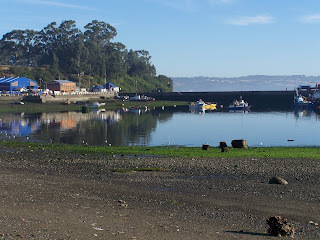 They were very sweet, and negotiated Chilean, not tourist, rates with the fishermen who took us out in their boats. 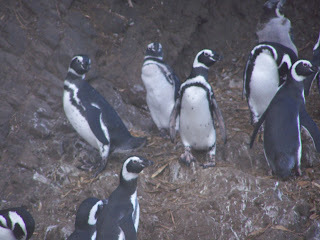 We saw Humboldt and Magellanic penguins, as well as cormorants and a nutria del mar - a sea otter. 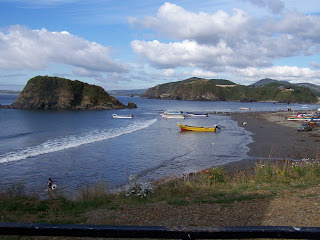 The island of Chiloé was the southernmost part of our journey - over 1100 kilometers from Valparaíso. 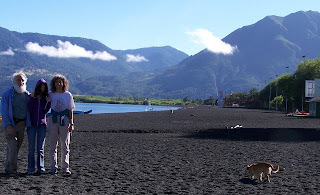 As we began to make our way back north, we took an eastward detour to Lago Todos Los Santos. 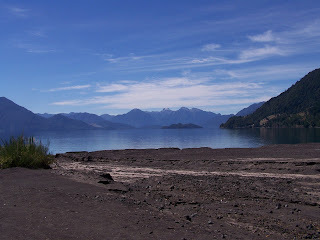 There is no road surrounding this lake; one can drive only to the easternmost edge of the lake via an unpaved road. Here the tourist shops and restaurants, that elsewhere dot the shores of the lakes in the Lakes District, drop away and unspoiled wilderness begins. 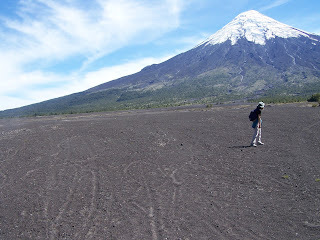 We had spent a good part of this trip admiring Volcán Osorno from afar; here we were able to get up close and intimate, hiking up to a lava field at its base, formed by a relatively recent eruption which transformed the area, rerouted a river and created a waterfall (Salto de Petrohué). 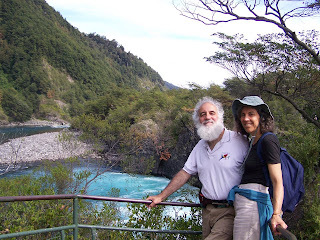 Our last stop on our northward journey was in the city of Temuco, a gritty, non-touristy down-home Chilean town (that reminded us, for those of you who can appreciate an Israeli analogy, of someplace like Afula - where ordinary people live.) Temuco, or so the guidebooks say, also has more Mapuche (native) influence than other Chilean cities; we saw this in the street performance of musicians in native garb (didn't get a picture of that), and in the Mapuche musical instruments for sale in the mercado municipal. 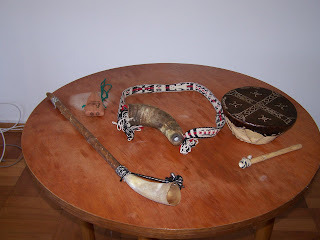 Jonathan bought a trutruka (horn on a long stick), a kull-kull (cow's horn with a woven strap), and a kultrum (drum). 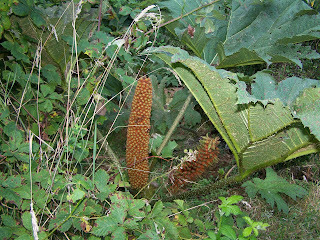 The fourth small item in the picture is a pifilka (a wooden whistle), thrown in as a freebie by the vendador. 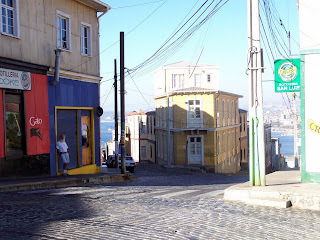 The final leg of the trip was an eight-hour drive back to our apartment in Valparaíso. Arriving around 10 p.m., we felt that it was good to be home - and realized that our cozy digs in this exotic yet increasingly familiar city were becoming home for us.